Offer expires at 23:59 CET on the 30th of November. 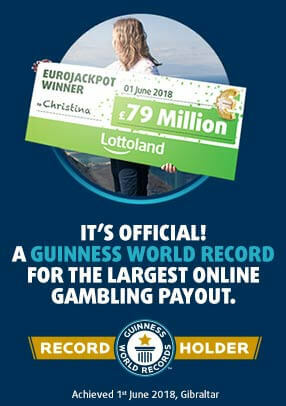 In order to qualify for a reward, you purchase a minimum of 3 Euromillionaire bets. Spins will be credited to your account automatically. Spins may be used on Starburst. The decision of the promoter in respect of any matter concerning or related to competitions and promotions is final. In the event of a breach of these terms and conditions the promoter reserves the right to take such action as it deems appropriate in its absolute discretion. Lottoland reserves the right to amend or withdraw any offer at any point at its sole discretion. The promoter general terms and conditions apply. Promoter: Lottoland Limited, Office Suite C, Ocean Village Promenade, Gibraltar (EU).